Link: June 14 AT&T Landline Notice Clarification? Link: ISPs Say They Need Government Money to Expand Broadband . . . What??? Link to Fiber is the Coming Tech Revolution — and Why America Might Miss It. Link to FCC Accounting Rules Are Frozen to the Year 2000 — Why? We want the wire itself to be regulated, which means that the price to use the wire is fixed and offered to all; the Telecom companies cannot charge whatever they want and discriminate. We want all of the assets that were built with customers’ money returned . . . We need more verifiable data from the Telecom Companies because the FCC and many State Utility Commissions stopped collecting data about Telecom Companies’ operations and performance and are erasing the accounting rules. I firmly believe that the principle of non-discriminatory access to communications, open communications network is vital to our economy and our democracy. If you look back over the history of capitalism, the principle of non-discrimination, sometimes called common carriage has been with us from the beginning. I like to say it’s part of the DNA of capitalism because in the capitalist system, the movement of goods and services is vital to economic activity. And the movement of ideas is vital to democracy and those two go hand in hand. By Bruce Kushnick, Updated 12/6/17; Original article here. Imagine if you could say anything or do anything, with the odds of getting caught being almost nil. Even if you are apprehended, there would be little, if any, repercussions. Welcome to "The Book of Broken Promises: $400 Billion Broadband Scandal & Free the Net". It is released as a Free PDF because these are critical times in the Telecom and Internet world. This is the third book in a trilogy that started in 1998 and it details some of the largest scandals in American telecommunications history. Let me tell you a story, which is told in all of its gory details in the book. By the end of 2014, Americans were charged about $400 billion by the local phone incumbents, Verizon, AT&T and CenturyLink, for a fiber optic future that never showed up. And though it varies by state, counting the taxes, fees and surcharges that you have paid every month (many of these fees are actually revenues to the company or taxes on the company that you paid), it comes to about $4,000–$5,000 per household from 1992-2014 — and that’s the low number. Each household was also charged about nine times to wire the schools and libraries with fiber optic cables via state and federal plans designed to help the phone and cable companies. Based on the commitments made by the Telecom companies in their press statements, their state/federal filings, and many State ‘alternative regulation’ plans, US households were charged for broadband upgrades they never received: promised upgrades from legacy copper to fiber optic cables to homes, businesses, schools and libraries that never happened. America, should have been the world’s first leading-edge fully fiber-optic broadband nation. AT&T, Verizon and CenturyLink stole the money that they expressly collected for the fiber upgrade. In 1992, the speed of broadband, as detailed in state laws, was 45 Mbps download/45 Mbps upload. By 2014, all of us should have been enjoying gigabit speeds (1000 Mbps). Instead, America is not 1st or 2nd or 5th or even 10th in the world in broadband. As of Monday, September 15th, 2014, one of the standard testing companies of the speed of broadband, worldwide, Net Index by Ookla, pegged America at 25th in the world in download speeds and 40th in upload speeds. Though this accounting varies daily, America’s download speeds are never in the top 20 countries. There is a copper wire that goes into your home, school or office as everyone in America is entitled to phone service. This copper wire was put in as part of the State-based Telephone Utility — the intrastate “PSTN” or “Public Switched Telephone Network”. Most of these PSTNs are controlled today by what are now AT&T, Verizon and Centurylink. These copper networks are aging since almost all of America had been copper-wired for phone service by the 1960’s. Starting in the 1990s, this copper wire was supposed to be replaced with fiber optic cables, which would allow for new innovative services, including cable TV and video. The upgrades were C by the State-based Telephone Utilities, so all of the upgrade were for Title-II-regulated lines. The fiber optic cables were supposed to be open to all competitors, incumbents and start ups at the same, non-discriminatory prices. You, the customer, would choose who offered you Internet, cable, broadband and even phone service over these shared fiber optic cables. And like fresh blood in shark-infested waters, what are now AT&T, Verizon and Centurylink claimed that if they were given more money, they would use it to wire whole states with fiber optic cables to the premises (FTTP): to businesses, homes, schools and libraries. 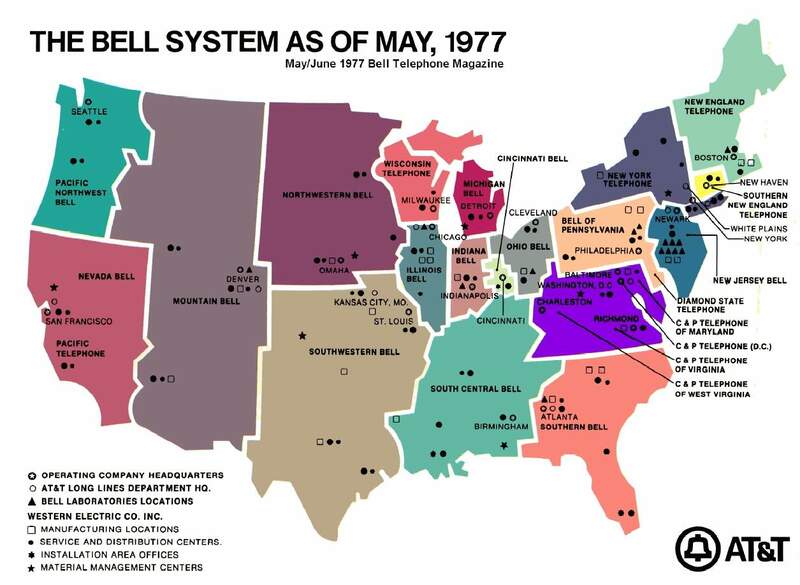 NOTE: At the time, there were seven ‘Baby Bells’, which were created in 1984, when Ma Bell, the original AT&T, was broken up. These included Ameritech, Bell Atlantic, BellSouth, NYNEX, Pacific Telesis, Southwestern Bell (renamed SBC) and US West. There were also some independent companies, like GTE and SNET (Connecticut). Buy 2007, however, the Baby Bells had merged to what we have today, and the original AT&T was eaten by its own children. By the 1990s, the ‘Era of Say Anything’ and never follow through was evident in many upgrade plans. Pacific Bell, California, in 1993, said it would spend $16 billion by the year 2000 and have 5.5 million homes wired with fiber optics. Ameritech (which included Ohio, Indiana, Illinois, Michigan and Wisconsin) stated it would have 6 million fiber optic lines by the year 2000. SNET (Connecticut) said it would spend $4.5 billion and have 100% completed by 2007. Ohio Bell, (now AT&T Ohio) claimed that 100% of schools and libraries would be upgraded to fiber by 2000. US West, (now Centurylink) which controls many western states, like Wyoming, Idaho, Colorado or North Dakota, told the public, regulators and investors that it would start a major deployment of fiber optic services, adding 1/2 million households a year. At the same time, the companies filed with the FCC to offer something called “Video-Dialtone”, which was to be able to use the phone networks to offer cable and video services. Nearly every Telecom company filed to offer millions of customers services by 2000. These deployments were made by the Title-II regulated State Utlities. All of these announcements were also in the Telecom companies’ annual reports, statements to the press, or in state and federal filings, it was always fiber optics, it would deliver broadband with speeds of 45 Mbps in both directions, and it included a cornucopia of new services, from interactive video and 500 channels of cable TV, to tele-medicine and tele-commuting. This would end up being ‘tell-legistlators-whatever-they-wanted-to-hear’. The same trick is being used by the Telecom companies in Federal and State Legislatures for Wireless 4G/5G expansions. But there was a catch . . . who would pay for these upgrades? The Telecom companies convinced State Utility Commissions to allow them to charge you, your business, your school, your libraries — anyone with phone service — to pay for these upgrades over and over and over. Starting in 1991, there were discussions of whether the government should build these networks, but the phone companies who controlled the state-based utilities in every state, saw this as a new mountain of money and said just give us a little more profit via deregulation (known as ‘alternative regulations’), and we will, of course, upgrade these copper networks to fiber optics. At this time, the companies’ wires were still monopoly controlled and the networks were closed to competition, so their profits were constrained to 12-14% a year. But, within literally a year after these ‘alternative regulations’ were adopted, the profits more than doubled to about 30%, (though it varied by state and phone company). By 1995, almost every state had granted some form of ‘alternative regulations’ that lifted the profit ceiling on most of the services. For example, Call-Waiting and Call-Forwarding were new services in the 1990’s. It cost the company less than penny to offer Call Waiting, and the other ‘calling features’ cost the company pennies, but they could charge $4.00-$7.00 per month for each service — and when you throw in everything from ‘non-published’ numbers to inside wire maintenance, all of this was new found cash. The Bell companies were also able to take massive tax write-offs. From 1993-1995, the companies took $25 billion in depreciation write offs, and were able to ‘speed up’ the tax deductions they could take as they claimed they would be replacing the aging copper wires with fiber optics. However, as soon as the ink was dry on the new laws, the companies knew they would never be held accountable to fulfill these commitments to upgrade the State Utility Networks, so little was built, and many lines that were upgraded were never ‘lit’ and remain today as unused, dark fiber. Some states, like SNET (Connecticut) or the Ameritech states, started rolling out fiber optic services for plain vanilla cable service instead of the committed 500+ channels of programming. However, these were all short-lived and all of these deployments would also be chopped; closed as soon as the companies began merging to create what is now AT&T and Verizon. SBC, (originally Southwestern Bell and now AT&T) led by Ed “The Hatchet” Whitacre, started the merger mania to marry the other ‘Bells’. SBC started off with Pacific Telesis (California and Nevada) and that plan to spend $16 billion dollars for 5.5 million fiber optic households was the first to go in 1997. SBC then took over SNET and shut down its cable services, and then merged with Ameritech, and the broadband/cable properties that had started to be built were sold off to WOW, a small cable company, post 2000. The irony was that SBC (now AT&T) had told the FCC that it was going to increase fiber optic broadband deployment if the merger of SBC-Ameritech went through — and it was all a mirage. In 2014, the current AT&T claimed that it would upgrade 100 cities with “giga-power”, delivering gigabit speeds — if the AT&T/Direct-TV merger went through — and this never happened, either. By the end of 2004, America was to have 86 million households upgraded. And by 2004, the phone companies had collected about $200 billion from customers in excess phone charges and tax perks. No state ever went back and either changed the laws to stop the customer overcharging or got refunds for the failure to do the upgrades. Some state advocate offices tried, but today, in virtually every state, the excess phone charges and tax perks are still being charged and hidden in the cost of the myriad of services, from Caller ID to even basic phone rates. And since that time, (1991-2004), there have been many other increases in every state, as well as increases and additions to the taxes, fees and surcharges. Instead of upgrading the old, copper, legacy utility networks to fiber optics, ALL of the Telecom companies pulled a bait and switch and around 1998 or later, rolled out ADSL over these aging copper wires. It was slow and it was considered an inferior product in 1992; it was the reason why the companies had pitched fiber optics because fiber can handle much higher speeds and has a larger capacity for video services. Because of this bait and switch, instead of investing in the regulated State Utility Networks, the companies invested in other unregulated businesses, like Wireless — using the money that was earmarked to upgrade the State Utility Networks from copper to fiber optics, AT&T and Verizon, instead, installed private fiber optic cables only to their 3G/4G Wirless towers. We paid for a broadband State Utility Network, but we never received it. This Utility Network was to be open to all forms of competition and American Consumers should have been able to choose their Internet, broadband, cable and phone service providers that operated over these shared upgraded fiber optic cables. This covers everything from Net Neutrality to the proposed mergers of AT&T/Direct-TV and Comcast/NBC, to the cable companies’ “Social Contract”, which was a plan to charge customers even more to wire the schools — money which is still being collected today. To bring this all full circle, the book also explains the current plans of AT&T and Verizon to dismantle the remaining utilities and shut off the copper in their territories’ (AT&T controls 22 states) wired networks while migrating customers to their own, more expensive, slower and less reliable Wireless service — instead of upgrading the Wireline networks from copper to fiber optics. We also report newly-found and previously\unexamined documents, financials and other materials that have not yet been made public. Using the extensive data and analysis presented, the book ends with a plan for next steps, including solving Net Neutrality issues. Ironically, (or sadly), I have told the story of the failed, fiber optic broadband deployments in America over and over. It appears in the first book of this trilogy, “The Unauthorized Bio of the Baby Bells & Info-Scandal”, published in 1998, with Foreword by Dr. Robert Metcalfe, the co-inventor of Ethernet (computer networking), and this story was extensively detailed in the second book, “$200 Billion Broadband Scandal”, published in 2005 and featured on Bill Moyer’s Emmy-nominated PBS special “The Net at Risk”, which aired in 2006. Click to order the third book and read there about what’s covered in this expose and in the two previous books in the trilogy. by Joy D’Angelo, 12/19/17 | Original article here. Pai’s entire statement on ending net neutrality hinges on the idea that telecommunication companies have been hindered in the “build out” of the infrastructure needed for a faster internet. Encouraged by light-touch regulation, the private sector invested over $1.5 trillion to build out fixed and mobile networks throughout the United States. 28.8k modems gave way to gigabit fiber connections. Innovators and entrepreneurs grew startups into global giants. America’s Internet economy became the envy of the world. To really understand just how fictitious Pai’s statement about 1996 is you have to go back to 1934 and then to 1984. There’s a series of books by Bruce Kushnick that gives an in depth analysis of just how much Americans has been screwed by these corporations. A great Huffington Post article is based on those books, and it has download links for the books. Here are the truncated facts. The Federal Communications Act of 1934 created the Federal Communications Commission (FCC). This was done in part because it was deemed that telephone service was a basic necessity — like electricity. Therefore, every household had a right to be wired for it. At the same time, the idea of leaving a national infrastructure issue in the hands of private corporations without some kind of oversight would be ludicrous. The reality is that corporations aren’t primarily concerned with the public interest. As such, the FCC was founded to make sure the American people got treated fairly. For the purpose of regulating interstate and foreign commerce in communication by wire and radio so as to make available, so far as possible, to all the people of the United States a rapid, efficient, nationwide, and worldwide wire and radio communication service with adequate facilities at reasonable charges. 1934’s was in the era of President Franklin Delano Roosevelt, the New Deal, and a general sense that government was actually for the people. The creation of the FCC was part of that movement. As such, like social security and medicaid, the FCC regulations meant to project Americans are things that the U.S. conservative movement like to rail against. That’s not saying that the implementations of the FCC have been perfect. As we can see, it’s subject to the whims of congress and their lobbyists. The first problem with 1934 act was that only one company — The Bell System — was handling all of the phone operations. It was a convenient monopoly. Eventually, after a series of lawsuits, Bell was found to be overcharging customers. The final 1984 lawsuit forced the company to be broken up into seven regional telecommunication companies . . . Those seven companies promptly discovered a way to create regional monopolies. Because of the 1934 principle that everyone had to have access to full phone service issue of long distance calling (in 1984 that was a thing – calling state to state was “long-distance”) each company had to provide equal access to their infrastructure to any company wanting to sell long-distance. That access had to be of the same quality of what a baby Bell company offered to their own local customer. As explained in a Vox 2014 article on Comcast – things got complicated. Before, making a long-distance call just involved one company, AT&T. Now it involved three companies: a Baby Bell at each end and a long-distance company in the middle. AT&T was one option for long-distance service, but it competed against rivals such as Sprint or MCI. The result of this was that consumers had two bills, one for local, the other for long distance. Each “Baby Bell” got to charge the consumers for basic local service – as well as charge the long distance company for giving them the access to that baby Bell’s part of the national infrastructure. Of course, that cost would then get passed along to the consumer. Rates quickly skyrocketed and companies had huge profits. This was helped by crying poverty and getting rate hike authorizations year after year. Here’s why understanding that long-distance mess is important. Ending net neutrality is basically a way to recreate this system for the internet. It’s a fairly technical explanation about why is true. A 2014 article by geek business blog Techdirt explains it best. Comcast’s ultimate goal is to effectively make the internet more like the old phone system, post AT&T breakup, in which everyone had to pay to access the end points of the network. Ironically, they’re trying to recreate the internet in the form of the old telephone network, while at the same time doing everything to resist being classified as a telephone network by the FCC. They’re seeking to have you both pay for your bandwidth and having internet companies pay again to get to you on the bandwidth you already paid for. Telecommunications companies have been hoping for this. It probably started as soon as they realized the potential of what the internet was. The way it all came together was truly a perfect storm. The 1970’s was the beginning of a focused rise in corporate-driven lobbyists. They were driven by things like fighting the formation of the Consumer Protection Agency. Meanwhile, the internet was invented in 1983, and the operational “World-Wide Web” – was in 1990. By the time 1996 came around corporate lobbying had gone from trying to block regulations they didn’t like to getting Congress to pass legislation that was profitable for their companies (TheAtlantic.com). It’s in this Washington atmosphere that lobbyists and Congressmen “worked together” to create the Telecommunications Act of 1996, a bill passed by President Bill Clinton. At the time Clinton and Vice President Al Gore had a vision of the nation being wired with fiber-optics, which would replace the copper phone lines that dial up internet access used. The companies agreed to that, in exchange for allowing telecommunications companies to own media companies.Between the growing World-Wide Web and the rapid rise of cable television, telecommunications companies clearly saw the potential of being able to own media. They wanted the ability to deliver content into people homes, as well as the source of the content. That’s why they were willing to promise a national infrastructure of fiber optics to get it. The 1996 TCA gave them the right to do both. Of course, that fiber optic network never really happened. Over the decades these companies have been given billions of actual dollars in subsidies and tax breaks to do it though. They’ve charged the consumers for this as well – but didn’t actually do it. Instead the money was used to expand into wireless communication and media broadcasting. It’s why today you have only a few companies to choose from. They’ve all merged with content provides and with each other. Deregulation has allowed the Telecom companies to own both the content and the method of distribution. Yes, telecommunications companies can do what Hollywood film studios cannot. That’s how many companies can bundle your phone, cable, and internet wireless services. To see just how disingenuous these companies have been, here’s another interesting wrinkle in the 1996 TCA. schools, libraries, hospitals and clinics have access to advanced telecommunications services, and calls for them to be connected to the information superhighway by the year 2000." Fiber optics are today’s basic infrastructure of communications, and these companies were paid many times over to build it. They just chose to spend the money given in ways that benefited them — not the country. Furthermore, they actually built some of it — but with provisions that denied most Americans access to it. Now they’ll be able to double-dip outrageous charges for internet access. So, don’t be surprised if fiber optics for everyone suddenly becomes available. If there was any doubt about the total contempt FCC chair Pai has for the consumers he’s supposed to be protecting, this video dispels it. Ajit Pai thinks what you do online is a joke. Even as he says ending net neutrality won’t change anything about what people can do online he’s laughing. That’s because he’s lying – and knows it. No longer will you be finding things that are popular first. Your provider will get to decide what you see first in a search, and what’s available for you to see at all. From a business perspective, ending net neutrality means startups are going to have a harder time – unless they can buy their way to the top. The idea that this is good for business is nonsense. It’s good for a few businesses – like Verizon and Comcast. That’s the truth about ending net neutrality. The only winners are big telecommunication/media companies. Having Pai be the FCC chair is akin to having Michael Flynn be on the National Security Council. There’s no foreign government involved, but like Flynn, Pai’s not concerned about what’s best for Americans. His priority is the welfare of the companies he’s worked for, lobbied for, and has been lobbied by. He’s now gotten them what they’ve wanted: a policy based on a model that was bad for consumers. He doesn’t care, because the few companies he’s been associated with will making even higher profits. BILL MOYERS: It’s one of the biggest political battles of the day. SEN. OLYMPIA SNOWE: As more and more citizens learn about the issue of "net neutrality," they realize that the Internet as they know it is very much at risk. BILL MOYERS: Congress is deciding the future of the Internet. BOB McCHESNEY: The decisions that we’re going to be making in the next two or three or four years are probably going to set our entire communication system, and really, our entire society, on a course that it won’t be able to change for generations. BILL MOYERS: At stake is the most promising breakthrough for democracy in our time. TIMOTHY WU: Today you have a situation where a blog can take on a cable news network or can compete for a cable news network’s customers based on quality, based on merit. BILL MOYERS: That could change as big corporations battle to control the information superhighway. MIKE McCURRY: We don’t start from the premise that automatically the government ought to get in and try to regulate. We ought to wait and see if there’s a problem first. BILL MOYERS: Those mega media companies are spending millions to get their way in Washington and across the country. TERRY HUVAL: As soon as we started talking fiber, telephone companies started their lobby. Cable television companies started their lobby. BILL MOYERS: But across the political spectrum citizens are fighting back. LITTLE BOY: Vote yes for fiber. GOBB WILLIAMS: I’m voting yes for fiber. JOAN BLADESS: The coalition we have is over 700 groups. Its economic and political and faith-based organizations all recognize that having a free and open Internet is crucial. BILL MOYERS: In this special report…THE NET AT RISK. BILL MOYERS: I’m Bill Moyers. Welcome to the revolution – the Internet revolution. It’s changing our lives as we speak, or click, or delete, or link. In just a decade, it’s made sending and receiving information easier than ever. It’s opened a vast new marketplace of ideas and it’s transforming commerce and culture. The Internet is revolutionary because it is truly democratic, open to anyone with a computer and connection. We don’t just watch; we participate, collaborate, and create. But this wide-open access could be slipping through our fingers. The Internet has become the foremost testing ground where the forces of innovation, corporate power, and government regulation converge. Already its founding principle – the notion of a level playing field, or what’s called Network Neutrality – is under siege by powerful industries trying to tilt the field to their advantage. It happened, remember, to television, radio, and cable; it could happen to the Internet. But citizens are fighting back; last spring they flooded Congress with more than one million petitions with a single refrain: "Save Our Internet." That was the beginning of a movement that has kept the outcome in play. Here’s our story, produced by Peter Bull and reported by Rick Karr. RICK KARR: It’s not hype. The Internet does have the power to change just about everything. DON BERTRAND: It literally puts the world at your fingertips in your home. RICK KARR: Revolutions like this one don’t come along every day. ROBERT McCHESNEY: The type of revolution that comes along maybe three times in our whole existence. Go back 60,000 years to the birth of language, 5,000 years to the birth of the alphabet and writing. 600 years ago, we saw the printing press. And the Internet is the complete culmination of it. RICK KARR: Never mind email and the Web – the real revolution is the Internet’s power to let people do things that, just a few years ago, they couldn’t have imagined. You want to see the world at your fingertips? Take a look at Provo, Utah where the Internet lets student pilots use a sophisticated flight simulator at home, while the same Internet lets an instructor miles away sit in the co-pilot’s seat and keep a close watch over the student, literally. RICK VINCENT: The instructor could even virtually hop-in to the aircraft the student is flying, and take over, if they weren’t flying an approach correctly, for example, which is just amazing that you could do something like that from 20 miles away. And if the technology is there, you could do it from 3,000, 4,000, or 20,000 miles away. RICK KARR: Or what about this: say you need a medical specialist, but there’s not one within miles of where you live. DR. SKALABRIN: Lyle, do you remember? LYLE KOFFORD: No. I can remember I couldn’t get my left arm and stuff to work right. DR. SKALABRIN: Do you feel normal on the left? DR. SKALABRIN: It doesn’t feel funny, or numb, or tingly? RICK KARR: Dr. Elaine Skalabrin is a stroke specialist at the University of Utah hospital in Salt Lake City. She’s using the Internet to examine Lyle Kofford, who’s with his wife, Janice at a clinic that’s about 150 miles away, or a three-hour drive. DR. SKALABRIN: Well, a stroke is very time dependent disease, basically. A blood clot blocks off the oxygen entrance going to the brain and the brain could die very quickly. So, we don’t have time to put somebody in a helicopter and fly them here or have their family member drive them to a closest specialist, and in most rural areas, there are very limited medical resources. RICK KARR: This high-quality audio-video link lets the doctor show them x-rays, zoom in on the patient, and even move the camera to look his wife in the eye. LYLE KOFFORD: She makes you feel like she’s right there, brings you right into her, she doesn’t make you feel distance at all. JANICE KOFFORD: It makes you feel more secure, knowing you got a specialist right there. DR. SKALABRIN: Truly, we make the diagnosis by looking at the patient. DR. SKALABRIN: Okay, open and hope and close the hands fast. DR. SKALABRIN: Interviewing the patient and watching how they move, how they talk, and that sort of, you know, to be cliché, a picture’s worth a 1,000 words, right? RICK KARR: But most of us here in the U.S. can’t get an Internet connection that’s this good unless we’re willing to pay around $350 a month. Compare that to the net service that’s available in Tokyo, Reykjavik, Seoul, Slovenia and elsewhere where you could get an even more powerful connection for about a tenth as much money. ARCHIVE FILM NARRATOR: You are listening to the heartbeat of the Sage computer. RICK KARR: The United States is the birthplace of the Internet and the home of high-tech, but we’re no longer tops in the world in high-speed online connections. In fact, the U.S. has dropped below tenth place and compared to some other countries, we’re pretty much crawling along the information superhighway. BRUCE KUSHNICK: America’s screwed. I mean we basically are becoming technologically deficient. RICK KARR: Telecom analyst Bruce Kushnick says that the only thing the U.S. is doing quickly is falling behind. BRUCE KUSHNICK: Right now what we have basically is sort of like, you know, still pictures versus what’s really going to happen next which is full motion video everywhere. We’re close to the dinosaurs compared to what these other countries are going to be developing in the next couple years. RICK KARR: Kushnick says that’s because telephone companies back in the 1990s promised that they’d hook us up to the information superhighway, but then reneged on that promise. RICK KARR: The network that they promised to build, what could it do? Give us a sense of had they actually built this network what could we have on our homes today? BRUCE KUSHNICK: Video basically allows us to do, for example, high-level video conferencing. Multi-video conferencing basically is the ability to have four or five or six people, with large screens, not these small little things, but large screens sitting around, seeing each other. What we have now is these little screens on the TV’s, you know, on your computer that are about this big and everything is jerky. Everything would be smooth, everything would look like as if we were in the middle of STAR TREK. RICK KARR: The world’s fairs of the 1960s promised progress and a space-age future. But we’re still waiting. RICK KARR: Okay, let’s stop for a second to talk about what all of this means and why we should care. When we say that one Internet connection is "better" than another one, what we’re really talking about is speed – how much information either of those connections can handle per second. Let me illustrate: when most of us first went online, we used what’s called a "dial-up" connection – you’d hook a phone line up to your computer, which would dial a number, then you’d wait while your computer connected, slowly, to the Internet. And "slow" is the key word. Web sites took ages to load … And if you could watch video at all, it looked like this with a small picture, crude images and jerky motion. Dial-up is slow, in part, because it relies on 19th-century technology: copper wire. RICK KARR: It was cutting-edge back when Samuel Morse and Alexander Graham Bell used it in the 1800s, but it can’t keep up with the Internet. At least, it couldn’t until engineers figured out how to squeeze a lot more information through a copper wire without tying up your phone line. This is what’s known as a "broadband" connection. It’s what most American homes that are online have right now from a cable television company or a phone company. It’s ten or thirty times faster than dialup, so Web sites load a lot faster, video images look a lot better, and you can do a lot more with one of these connections. But it’s still limited by the 19th century technology of the telephone and telegraph: copper wire. RICK KARR: So there are 96 fibers inside this tube? L.U.S. WORKER: Inside this tube, right. RICK KARR: But glass is today’s cutting-edge technology. L.U.S. WORKER: – has twelve fibers in it. RICK KARR: You can see them. L.U.S. WORKER: In the very tip there, right. RICK KARR: Fiber optic cables are long, thin strands of glass that transmit bursts of laser light and carry information faster than any copper wire. L.U.S. WORKER: Right now I’m stripping the ends of the fibers. This is the actual glass, the fiber itself. RICK KARR: These tiny glass fibers are connecting homes around the world to the information superhighway around 40 times faster than the broadband most Americans get from their cable or phone company. So we’re still in the slow lane of the Internet revolution. JOEY DUREL: I read somewhere that to download the Library of Congress on a dial-up modem, would take 82 years. To download the Library of Congress on fiber, at a speed that’s available today, not to the average consumer, but technologically is available today, would take 45 seconds. RICK KARR: Most Americans can’t get high-speed fiber connections like that. But at some schools, for instance, like the pilot training program at Utah Valley State College, you can experience Internet speeds ten to twenty times faster than what’s available in most U.S. homes. If you had a connection like this, you could learn to fly, study a foreign language, tutor a child or mentor a student online. Fiber optic networks could revolutionize how we learn. RICK KARR: They could also change our democracy for the better. For example, you could go online to participate in a town council meeting – not just listening and watching high quality video, but actually participating, joining in, asking questions. So that everybody who’s actually at the meeting could see and hear you. BRUCE KUSHNICK: In Korea and Japan, you can get 100 megabit services in both directions for about $40. RICK KARR: That’s 100 times as fast for the same price. The U.S. had a chance to start building Internet connections like that back in the early 1990s. BRUCE KUSHNICK: It was, actually Al Gore may not have invented the Internet, but he really was a proselytizer for new fiber optic networks. That was 1992-93 time frame. And essentially all the phone companies then basically said, "We’ll step up to the plate and we’ll do this wiring plan." None of that ever happened. RICK KARR: Kushnick and his colleague, Tom Allibone, are telecommunications muckrakers who call themselves "Teletruth." They’re in the process of filing lawsuits against several regional phone companies. They allege that the baby bells promised fiber-optic connections nationwide but didn’t deliver. BRUCE KUSHNICK: By the year 2006, our research shows that 86 million households should have been wired with fiber, i.e. the majority of the United States. Had they just kept the, the eye on the ball and done this work, America would not be in the situation we are in today which is inferior services for high costs. RICK KARR: Why didn’t the network get built? I mean, they made all these promises, it sounded like it really was the information superhighway that we heard about in the 90s, why didn’t it get built? BRUCE KUSHNICK: The reason why it didn’t get built is because none of the regulators stepped up to the plate and held the phone companies accountable. RICK KARR: Phone companies are regulated in part by the states. Kushnick and Allibone say that back in the nineties the phone companies offered to invest billions to build fiber optic networks if the states let them take large tax deductions and raise the price of basic services. BRUCE KUSHNICK: Call waiting, call forwarding, caller ID cost about a penny to offer. They charge $5.30. All of that is profit to them. Under the old regime they would have to return all the extra money. They wouldn’t be allowed to keep these profits. RICK KARR: Under the old regulations, the phone companies were required to pour those profits back into their networks – in other words, to keep improving their infrastructure. TOM ALLIBONE: Phone companies historically were regulated as a public utility. And the format or the type of accounting system that was utilized in the public utility industry was something called rate of return. One of the reasons or ways to promote competition was to do away with rate of return regulations and give the phone companies the ability to make unlimited profits, that’s really what it was all about. BRUCE KUSHNICK: You ask people, "Did I ever pay for a fiber optic network?" They go, "Well I don’t know." And the answer is this: well you paid for it, you don’t even remember it. And the regulators, even though it’s on the books, a lot of the regulators, oh, I hate to say this, but basically they were too close and cozy with the phone companies. RICK KARR: The regulators he’s talking about are state utility commissioners. They were supposed to make sure the phone companies kept their promise to connect millions of Americans to the information superhighway at 45 megabits per second. In New Jersey, for example, the phone company promised 5 million of those connections by last year. RICK KARR: Right now, today, how many houses, right now today, how many homes in New Jersey actually can get this kind of 45 megabit service? TOM ALLIBONE: Well actually, zero. I mean, no one can get 45 megabit, it doesn’t exist. The only thing that comes close is in a commercial type of environment you know, for very specialized types of applications. But, there’s no such thing in a residential consumer marketplace. RICK KARR: According to Teletruth, phone companies took $25 billion in tax write offs while revenues soared 128%. But they didn’t build the fiber network they promised. BRUCE KUSHNICK: So, with all this cash cow, what do you do with the money? They should have said, "Why don’t we build the best network we can and therefore it’ll basically, the infrastructure, and basically make our infrastructure the best in the world." And they didn’t do that. They basically took the money and ran. RICK KARR: wanted to call this story "David versus Goliath." They were struck by the fact that after the phone companies failed to build the information superhighway they had promised, several towns and cities across the country took matters into their own hands and decided to build their own fiber optic networks. That has landed almost every one of them in a David versus Goliath battle as phone and cable giants push back, determined to outlaw what they call "unfair competition" from municipalities. For a case study, Peter and Rick traveled to Lafayette, Louisiana, the heart of Cajun country. JOEY DUREL: We have an out-migration problem with our young people from Louisiana, and I felt it was time for politicians to quit talking and do something. RICK KARR: Something like building every home and business in town its own fiber optic connection to the information superhighway. DON BERTRAND: We see telecommunications in the way of Internet, in the way of fiber connectivity as something that should be available to everyone. STEPHEN HANDWERK: Just like water, sewer, electricity, telephone. I mean it all falls into that same lump. JOEY DUREL: I think this is a tremendous opportunity for small business and to attract business here. RICK KARR: Lafayette’s phone company, BellSouth, and its cable company, Cox Communications, told residents that they’d have to wait a decade or longer for better Internet connections like the ones they take for granted in Tokyo. STEPHEN HANDWERK: Up until recently, the majority of the parish only had one-way communication on their cable, so they could download information. However, but to be able to send any information, they had to be able to connect through a phone modem. JOEY DUREL: If we didn’t do it this community would not get it for 20 or 30 years, who knows? JOEY DUREL: And what was your name? RICK KARR: Joey Durel is the city/parish president of Lafayette. He calls himself a progressive Republican who sees no reason why local government shouldn’t provide services that the private sector won’t. JOEY DUREL: You know, there are things that are going to be available three, or four, or five years from now that nobody has even thought about yet, and that’s going to happen. And Lafayette will be uniquely positioned to take advantage of that, unlike most of the country. RICK KARR: So what the city decided to do was build its own fiber network through its municipal power and water company, Lafayette Utility Systems or LUS. RICK KARR: Terry Huval is the utility’s director. RICK KARR: A lot of people think of the Internet as being sort of the triumph of the marketplace, the triumph of entrepreneurship. Why would a public utility need to get involved with the Internet? TERRY HUVAL: The community wanted to have competitive options for telephone and mainly cable television service. Cable television service drove us even to look at this. Because people were so dissatisfied with the cable TV company continuingly going up on their rates. TERRY HUVAL: That’s what created the vision of saying, "We can do something special for our community, for the people that own this utility system." RICK KARR: He realized that LUS could extend the network to every home and business in town, and provide better Internet service at a lower price, if the city could raise 125 million dollars by selling bonds. STEPHEN HANDWERK: We said, "Guys, come on…"
RICK KARR: Some residents launched a grass roots campaign to support the community fiber plan. They called themselves "Lafayette Coming Together," and they got together at a local restaurant to tell us about their unusual coalition. GOBB WILLIAMS: I’ll repeat this till the day I die, can’t nobody else compete against corporate America but government. And when I saw the government willing to take a stand in regards to helping the people of this community, I said, "I’m getting on board this train." ANDRE COMEAUX: We have a mix in this room, Democrats and Republicans. I’m definitely on the conservative side. This is not a traditional place for conservatives or Republicans to be. RICK KARR: Last time we were here somebody made an analogy to roads and said, you know, we expect that the government is going to build roads because that’s essential to commerce and this is akin to that. ANDRE COMEAUX: That’s another reason I think conservatives have been able to come over to support this effort, it’s infrastructure. And that’s one of the things that we look to our government to provide. TERRY HUVAL: The big thing for us is realizing that the future of the world in communications is going to be big pipes, big bandwidth, big capacity. And that we were going to be left behind, just like we would have been left behind with candles in 1896. RICK KARR: It was in 1896 that Lafayette residents set a precedent for today’s fight over fiber. The city had been passed over by private companies selling a cutting edge energy source: electricity. JOEY DUREL: They had much bigger cities that they could go to like Baton Rouge and New Orleans at the time. And so they passed us by. Well, our community decided that we wanted electricity. That’s when LUS, the Lafayette Utility Systems was formed. And so we had a good message: "If we don’t do it, we don’t get it." RICK KARR: Until the city of Layfayette decided to "do it", BellSouth and Cox were in no hurry to improve internet service. But as soon as there was a threat of some competition from the city, they jumped into action at the state capitol. TERRY HUVAL: As soon as we started talking fiber; as soon as we started laying out, in a public way, that we were thinking about doing this, telephone companies started their lobby. Cable television companies started their lobby. RICK KARR: Cox and BellSouth had plenty of clout in Baton Rouge, and they used it to try to kill Lafayette’s fiber plan. They argued that it represented unfair competition. They wouldn’t speak to us. RICK KARR: One of the criticisms that opponents of municipal networks make is that LUS. doesn’t pay taxes. So you have an unfair competitive advantage over for profit companies. TERRY HUVAL: Pure bunk. Pure bunk and they know it. Currently we’re paying somewhere over 10% of our gross revenues in lieu of taxes. That’s greater. That’s about $17 million. That is greater then, by tenfold, what the telecommunications companies are paying in Lafayette. So we’re actually paying a higher burden. MOM & DAUGHTER: Vote yes. MAN: Vote yes for fiber. CAJUN GIRLS: Votez oui pour fiber. RICK KARR: The city and the communications giants agreed to put it to a vote: Lafayette residents would decide whether the city could issue $125 million in bonds to pay for the fiber network. Without the deep pockets of the phone and cable giants "Lafayette Coming Together" put together an inexpensive and inventive campaign. It included something called the "fiber film festival": short, homemade videos distributed over the Internet. SLICK SAM SLADE: So it boils down to this: this good-looking, fast machine right here – which you don’t really want – or this really nice, fit-you-like-an-old shoe-type thing right here. Hey, it’s a deal-in-a-century to me. What do you think, Lafayette? ANNOUNCER: Sorry Sam, Lafayette’s not interested. RICK KARR: It was what’s known as a "viral" Internet campaign – not a virus that infects a computer, but something that’s funny and compelling that people spread from computer to computer. ANNOUNCER: Wake up. Smell the coffee. You’re getting snowballed. Cox and BellSouth are spreading disinformation in an effort to rob you of your opportunity to have a superior high speed fiber optic television, Internet and phone connection direct to your home and your chance to pay 20% less. We can rise above that, Lafayette. On July 16th you can vote ‘yes’ for LUS fiber to the home. Vote yes for the future. Show some teeth. MAN: Vote yes for fiber for Lafayette. JOEY DUREL: People all over the world were looking at this Fiber Film Festival, just laughing about this, and just thrilled with it. And I’d get emails from people saying, "Don’t let them stop you, don’t let them slow you down." TERRY HUVAL: Take a pause and savor the moment. You have been part of making history. RICK KARR: On Election Day, the people of Lafayette enthusiastically agreed to build their own fiber network: 62% voted to let the city borrow the money and start construction. JOEY DUREL: And the reason we got the vote, I said it often during the campaign, was price and pride. People are going to save money. And people are proud in this community. And they’re proud of being a progressive community. And so, I think that’s what won the vote for us. RICK KARR: The phone company wasn’t about to roll over, though: BellSouth filed suit against the plan, once again claiming unfair competition. The court battle has delayed construction by more than a year and cost the city more than $125,000 in legal fees. DON BERTRAND: What they’ve been effective at, in the past, to create fear, is to stretch out the time it takes for any fiber optics to get actually online so that they can say "Well, look, they’re not meeting their expectations. Their business model has failed." RICK KARR: Despite the victory at the polls, the legal battle drags on: the city of Lafayette has had to ask Louisiana’s highest court for permission to finally connect residents to the fiber-optic fast lane. JOEY DUREL: As I told my community, to them we’re nothing but a chocolate chip in their jar of chocolate chip cookies, you know. But the last thing they wanted to see was a community the size of Lafayette held up as a success. BILL MOYERS: A few other communities across the country have also taken on the phone and cable companies and, like Layfayette, succeeded in building municipal networks. But it’s an itch the two industries are trying to keep from spreading. They spend around $40 million a year on lobbying in state capitals, and so far they have convinced legislatures in 14 states to make it more difficult or impossible for communities to build their own network. We’re talking here of a powerful duopoly – less David versus Goliath than one giant against another. That’s because in more than 90% of American homes phone and cable companies are the only two potential sources of Internet service. The cable company’s only competition is the phone company, and vice versa. To slice off business from their cable rival, the phone companies now say they are going to build a new network of Internet service that will be even better than the one they promised in the 90s but never produced. Once again, though, they want something in return: they want control – not just over the copper wires and fiber optic cables but control over the Internet itself. RICK KARR: "Information Superhighway" is a good name for the Internet because it really is like a road. When you send an email, for instance, your computer wraps it in a kind of digital envelope then sends it online. That’s it there on the on-ramp. Once it’s on the road, it’s the same as any other information – say, a videoconference between lawyers – or a song on its way to an iPod. The net doesn’t care why it’s there, or what’s inside. Telephone companies say the highway’s getting crowded, with box trucks carrying Internet phone calls and 18-wheelers full of video, and that it’s headed for information gridlock. MIKE McCURRY: You have to have a vision of the future that includes all of the data that’s going to be streaming into the home in the form of videos coming in. You know, services that we can’t even imagine yet. RICK KARR: That’s Mike McCurry. A few years ago he was press secretary in the Clinton White House. Now he’s working as a lobbyist for the industry that wants to kill net neutrality. His clients – giant phone and technology firms – want to turn the information superhighway into a toll road. MIKE McCURRY: What we’re really talking about is the same old dumb pipe that we have today that is sooner or later going to get clogged with too much traffic; or, a smart, more efficient, and faster network that manages traffic that treats video information differently from voice information, and differently from text information so that you actually are using technology to manage the way that information flows inside the network. RICK KARR: McCurry’s clients want to "manage" the traffic by building tollbooths on the highway because they failed to deliver the fiber networks they promised in the nineties – networks that could have handled the extra traffic like video downloads. MIKE McCURRY: They in effect want to operate a super highway, but then build a separate premium lane next to it that they’re going to charge big content providers for and then, spread the costs throughout all these big users. RICK KARR: So if "big users" like Google and Yahoo pay the toll, they’ll be able to speed information down the fast lanes. If not, they’ll be stuck in the slow lanes along with everyone else who couldn’t pay the fees. The phone companies have been making their case for dividing the highway in Congress. REP. FRED UPTON (R-MI): Sure you might have different speeds, but let’s use the analogy of what happens here on the East Coast. People go from Washington to New York on Amtrak, right? They can pay a little more and take the Acela, which is, you know, pretty fast. But it runs on time. They can pay a little bit less and take, you know, the local. Speeds for Internet connection will only continue to get better. And for those who invest in this new infrastructure – and it’s not cheap – they ought to have a right to say, "Well, if you want to pay a little bit more you might get a little better degree of service." RICK KARR: That’s all McCurry says his clients want. MIKE McCURRY: We charge 18-wheelers a higher tax because of the extra load that they put on the road. But that in effect is what we’re talking about here: an additional charge by these super huge users of the Internet and allow them, you know, ask them to spread the cost of building some of this network out among their customers. RICK KARR: But "huge users of the Internet" like Google, Yahoo, and eBay, for instance, already pay millions a month for net access. Skeptics say the phone companies are really up to something else, entirely. TIMOTHY WU: It’s just the Bell companies want the opportunity to charge twice. They want to charge for Google to connect to the network at all, and then they want to charge another price to reach their consumers. RICK KARR: Timothy Wu teaches technology law at Columbia University. TIMOTHY WU: You know, companies can do two things, they can either offer more value, or they can try and extract cash from companies because they’re in a position to threaten them. The first helps the economy, the second is just extortion. It’s the Tony Soprano system, you know, it’s like a protection racket, and it’s not an economically productive activity to toll booth companies because you happen to have the power over the gateway to do so. RICK KARR: Wu says the phone companies’ plan would strike down the most important rule of the Internet in place from day one: that once you’re online, it’s like being on a highway – the speed limit’s the same for everyone – and you can go just as fast as anyone else. But not under the phone companies’ plan. Let’s say Verizon is running the "Internet tollbooth" in your neighborhood, and Yahoo and Google are lined up to pay. Verizon could decide to charge Yahoo a low toll for access to the fast lane but demand a prohibitively high fee from Google, relegating it to the slow lane. So Yahoo’s search engine would come up on your computer almost instantly while Google’s wouldn’t. That kind of discrimination is a lot like something that happened in the 19th century in an earlier round of the media revolution. NARRATOR: Write on a telegraph blank, and your words appear magically on a piece of paper thousands of miles away. RICK KARR: In those days, Western Union had a monopoly over telegraph wires. The company gave the associated press a big break on fees but charged other news organizations a lot more to keep them off the wires. TIMOTHY WU: And they used that monopoly, they used it to favor political parties they liked, they used it to favor political candidates they wanted to destroy. RICK KARR: So how did that instance of discrimination get broken? TIMOTHY WU: Eventually the government intervened with something called "common carriage." Thought is- they said the telegraph is no different than an inn keeper, no different than a port, no different than a train, it has to carry everybody’s stuff equally. RICK KARR: So this idea of common carriage, the idea is that as long as I can pay, you have to take my business. TIMOTHY WU: Right, correct, that’s the idea. You have to pay, and then we don’t discriminate as who you are. And government since the 16th century have felt that certain parts of the economy, ports, canals, roads, trains, inn keepers, have to deal with all customers equally, that that’s important for the health of the country. And I think we have the same situation: The port and canals of the eighteenth century are the Internet in the 21st century, and that’s why we need to re-learn those lessons. RICK KARR: Remember, common carriage means the network doesn’t discriminate. The Internet version of common carriage is known as "network neutrality." That means the Internet is "neutral" in the same way the grid that supplies electricity is neutral – it doesn’t discriminate between things you might plug into it. TIMOTHY WU: You have the grid, and it makes a lot of things possible. You can plug a lot of things into it, and we’re not stuck at the first generation of vacuum cleaners. Vacuum cleaners now are better than they were 40 years ago, and one of the reasons is because the electric network, the current that comes out, is neutral. It has no opinion as to whether Samsung or General Electric makes a better device. It just gives the electricity, and whoever wants to can design a product to those specifications, and the same thing is true with the Internet. It’s maybe the easiest way to understand it. There’s two sides: there’s the market for the appliances, that’s Google, and that’s Yahoo, and that’s all these other companies, and then there’s the companies that supply the wires, the electricity. RICK KARR: But without neutrality, Wu says, Internet companies and Web sites that couldn’t afford the toll for the fast lane would be at a huge disadvantage because it might take so long for them to load onto your computer that you’d give up and go to sites that could afford the toll. TIMOTHY WU: The thing about the Internet is we don’t always know what’s going to come next. Who would have predicted blogs? Who would have predicted that YouTube would take off? Who would have expected that Google would be the dominant search engine ten years ago? Nobody knew. And one of the reasons that all these things keep showing up is because the whole world has a chance to show up and try and create a new application. RICK KARR: Those new ideas were possible, because until recently, the federal government played traffic cop and enforced the net neutrality rules. EARL COMSTOCK: It is basic government regulation that allows access to this common infrastructure, that is critical to the original birth of the Internet and to the ongoing operation of the Internet. RICK KARR: Earl Comstock represents companies that depend on equal access to the Internet – for example, a company called Vonage that lets you make phone calls over your Internet connection. EARL COMSTOCK: So my companies would be hurt, because without that right to interconnect, we’re unable to provide service to customers and that then diminishes competition, which means higher consumer prices, less innovation and fewer choices. RICK KARR: Other advocates of neutrality say it protects free speech because without it, phone and cable companies could censor Internet traffic they don’t like. LARRY PRATT: It happens that a lot of the I.T. industry isn’t terribly enthusiastic about the Second Amendment. RICK KARR: Larry Pratt is director of Gun Owners of America. LARRY PRATT: We want that the Brady Campaign and Gun Owners of America to have the same fair use of the Internet highway. And we don’t want speed bumps that are allowed by government to be placed on one side or the other. So, if we want to buy 100 units of Internet broadband capability that should be the same price to us as somebody else. And that way, we’re guaranteed that if our supporters support us enough, we’re going to be able to get our message out regardless of what the big boys may or may not like. RICK KARR: Those "big boys" in the cable and phone industries spent years fighting net neutrality. They said the law was ambiguous and archaic, because it was drawn up for the old world of copper wire before broadband. In 2002, the Federal Communications Commission decided that neutrality didn’t apply to cable internet and in the summer of 2005, the FCC let phone companies off the hook, too. Suddenly, there were no more net neutrality rules. The FCC replaced them with suggested "principles" for an open Internet. REP. ED MARKEY (D-MA): A principle is never enough. You need to have rules and you have to have enforceability. REP. ED MARKEY: This is the opportunity to vote to keep the Internet the way it is. RICK KARR: In Congress, Democrat Ed Markey led a movement to pass a law that would restore the rules of net neutrality. REP. ED MARKEY: Net neutrality was the rule until August of 2005. Since August of 2005, telephone company executives have been saying, "They’re our pipes. We built those pipes. We have a right to create the rules for those pipes. We have a right to charge whomever, whatever we want." Those are the new rules. The rules of monopolists. The rules of duopolists. We have to go back to the rules which created the Internet and served it very well until August of 2005. REP. FRED UPTON (R-MI): We’re not going to go back. RICK KARR: Republican Fred Upton says the rules just aren’t necessary. REP. FRED UPTON: A lot of us believe that we don’t have a problem today. And we’re not going to regulate, overly regulate a product, when, in fact, we don’t have a problem, which might stifle the entrepreneurship and the progress we want to make in the future. RICK KARR: But advocates of neutrality wonder, whose entrepreneurship? Whose progress? The phone and cable companies? Or the hundreds of thousands of online bloggers, activists, advocates, artists, and journalists who were thriving under the old rules? TIMOTHY WU: Today you have a situation where a blog can take on a cable news network or can compete for a cable news network’s customers based on quality, based on merit. If people like Instapundit better than they like CNN, or they like the commentary on Daily Kos better than they like Fox, they can go there. And they’re about equal. I mean, they have more money, but they’re about equal. And often you find out that a successful blogger will have more customers, more people watching than CNN CROSSFIRE. This is because the network isn’t discriminating, isn’t picking favorites. In a network that picks favorites, where one is faster, or the other is blocked or harder to reach, that favors the entities that are established that can pay the companies, and ultimately changes the entire information environment. RICK KARR: It sounds like what you’re saying is that we’ll have sort of the same media that we had in the pre-Internet age, in other words, not as open a forum? TIMOTHY WU: I think that’s right. I think we’ll go back to the way things have always been, which is to say a couple entities with the resources to do so will have more access to consumer. RICK KARR: Big media companies, like the ones that’ve consolidated control over the rest of the media, like radio and TV and publishing, where fewer and fewer companies own more and more: television, for example, where just six companies control all four of the big networks and a majority of the channels on most cable systems. REP. ED MARKEY: In a very real way, the antidote to the consolidation in the traditional media was the emergence of the Internet as a place where people could break through those barriers, that consolidation, and gain access to the information. The products, the services, the ideas that they wanted to have in their lives. BOB McCHESNEY: That’s where the genius of the Internet was: That it made the First Amendment a living document again for millions of Americans for whom it had lost its meaning. The First Amendment had become what AJ Liebling famously said, you know, "Freedom of the press belongs to those who own one." Well, this basically made freedom of the press belong to everyone again. The fact that it is truly an open environment, where the costs are so low, people have a chance to get in there and say something without being censored. RICK KARR: Media scholar and reform activist Robert McChesney and his allies in the fight for net neutrality say this openness is so valuable to democracy that we can’t afford to let it change. BOB McCHESNEY: The decisions that we’re going to be making in the next two or three or four years are probably going to set our entire communication system, and really, our entire society, on a course that it won’t be able to change for generations. It will set institutions and rules in place that we’re going to build on. RICK KARR: Advocates of neutrality worry that the new rules for the Internet are being written by companies that are interested mainly in controlling the cable TV business, which is worth about a hundred billion dollars a year. That’s because, increasingly, all television, as well as phone services will be coming by way of your computer. RICK KARR: Last summer, the telecom industry spent millions of dollars on ad campaigns aimed mainly at members of Congress. The telephone and cable companies were battling for new legislation that would lock in their control of TV services offered over the Internet. BOB McCHESNEY: These are companies that, without exception, are all based on getting government monopoly licenses, government monopoly franchises for telephone service or cable service in their communities. Their most important work, their victory in the marketplace, isn’t with consumers. Their marketplace, so to speak, is in Washington, or it’s in state capitals, or it’s in City Hall, getting politicians to give them these monopoly licenses. RICK KARR: Cable and phone companies spend millions to get that message across: the cable industry’s trade group and top firms, for example, spend around $12 million a year to lobby D.C. lawmakers and give their campaigns about $5 million per election. Among phone companies, AT&T is the nation’s second-largest campaign donor. And every year, Verizon spends nearly as much on lobbying as the whole cable industry. One report estimated that this year the two industries have been spending one point five million dollars a week to influence Washington. CONGRESSMAN: The unfinished business is a request for as recorded vote on amendment number 7 printed on House report 109-491 offered by the gentleman from Massachusetts, Mr. Markey. RICK KARR: In June, that strategy paid off: even though advocates of net neutrality say it’s the first amendment of the Internet, the House of Representatives refused to reinstate it. HOUSE VOTE: The amendment is not agreed to. RICK KARR: Those advocates say that if the Senate goes along, it would be one more victory for big media conglomerates. Like what happened with the Telecom Act of 1996 when the Republican Congress and President Clinton gave big media companies the power to get even bigger – to own more and more TV and radio stations. BOB McCHESNEY: Very powerful lobbyists, phone companies, media companies, cable companies, computer companies, were duking it out, basically, to make sure the rules were changed to benefit them. There was a clear understanding then, as there is now, that the government was going to set the rules. There was no such thing as deregulation. Deregulation’s a misnomer then, as it is now. RICK KARR: In other words, McChesney says, "deregulation" means government and industry co-operated to rig the rules. After the House voted against net neutrality, a bipartisan group mounted an effort to fight for it in the Senate. SEN. OLYMPIA SNOWE: Every day as more and more citizens learn about the issue of "net neutrality," they realize that the Internet as they know it is very much at risk. The idea that brings us together is a free and unfettered Internet for the 21st century. RICK KARR: Republican Olympia Snowe came together with Democrat Byron Dorgan to argue for restoring network neutrality. Their plan won support from an eclectic coalition of citizens. JOAN BLADESS: The coalition that we have is over 700 groups. So, there’s a huge breadth and its economic and political and faith-based organizations all recognize that having a free and open Internet is crucial to being able to work well with their members. RICK KARR: Joan Blades is a co-founder of liberal group MoveOn and Michele Combs is director of communications for the Christian Coalition. MICHELE COMBS: Our organizations, even though we may not agree on a lot, we’re very similar, that we are, you know, we try to get our supporters out on an issue. We try to activate people. And with net neutrality, we’re allowed to do that. Without it, we would not be able to. Last year, there was a bill on the floor. And we realized it, that it was about to become passed, where there’s some amendments attached to the bill. And we didn’t agree with it. And we did an action alert. And within an hour, congressmen were actually changing their votes, because they were receiving phone calls and e-mails from our supporters. So, if we didn’t have the access of the Internet, we couldn’t have sent out our action alert. JOAN BLADESS: The public square has been shrinking in the real world in the last couple decades. You don’t have the town square anymore, the mall is the new town square and the mall is privately owned. You go in there with a political voice and you can be sent away. Where do you go? The Internet has been this bright spot where there’s been this vibrant growth, citizen participation. If net neutrality doesn’t become law, future MoveOns wouldn’t happen. MoveOn happened seven and a half years ago, a mom-and-pop shop, essentially. We spent $89 and put up a Web site. And we had equal access to people as anyone else. And it just grew to a half a million people. That won’t be able to happen if the Internet has a slow lane and a fast lane. And that’s what’s at risk. RICK KARR: Mike McCurry says not to worry. MIKE McCURRY: We don’t start from the premise that automatically the government ought to get in and try to regulate. We got to wait and see if there’s a problem first. They can’t, you know, ask MoveOn and Christian Coalition, "Do you have any problems sending your stuff out today?" The answer’s no. They’re just worried about a hypothetical problem that has not yet arisen. RICK KARR: Now, what representatives of the telephone and cable companies say is, "We’d never block anybody’s message." Do you trust them when they say that? MICHELE COMBS: Well, if that’s really how they feel, then that’s what they should put into law. That’s what the FCC should come out and say, if that’s really how they feel. RICK KARR: Net neutrality fared better in the Senate, where the Commerce Committee vote on Snowe and Dorgan’s bill was a tie, leaving the fate of the Internet up for grabs. Neutrality advocates say without a law, they don’t have much faith that phone and cable firms will keep their word. And they worry that government watchdogs will turn into corporate lapdogs. BOB McCHESNEY: Now the phone companies said, "You can trust us. You know, we’re just out to make money. We’re not going to interfere with anyone’s political speech." But you know, the government says that too, we don’t trust them. You know, you just don’t give people that power if you don’t have to. And we don’t have to. BILL MOYERS: We turn now for some conversation with a man whose work has helped define this debate. Mark Cooper is director of research at the Consumer Federation of America and a fellow at the Stanford Law School Center for Internet and Society. He’s been called over 250 times to provide expert testimony to courts, legislatures and regulatory agencies, yet still has found time to write or edit several books including this one, Media Ownership and Democracy in the Digital Information Age and this one, Cable Merges and Monopolies: Market Power in Digital Media and Communications Networks. BILL MOYERS: Thanks for being here. MARK COOPER: Thanks for having me. BILL MOYERS: In the interest of full disclosure, you’re not a neutral observer in this story? The Consumer Federation is part of the Save the Internet Coalition fighting for net neutrality, right? BILL MOYERS: So, what’s your dog in this? MARK COOPER: Well I firmly believe that the principle of non-discriminatory access to communications, open communications network is vital to our economy and our democracy. BILL MOYERS: So, it’s not just democracy? It’s capitalism you’re talking about? MARK COOPER: Oh, absolutely. If you look back over the history of capitalism, the principle of non-discrimination, sometimes called common carriage has been with us from the beginning. I like to say it’s part of the DNA of capitalism because in the capitalist system, the movement of goods and services is vital to economic activity. And the movement of ideas is vital to democracy and those two go hand in hand. BILL MOYERS: It’s not quite David versus Goliath. You’ve got Yahoo and Microsoft and eBay on your side. I noticed that the head of eBay sent an email to millions of customers alerting them to the dangers of the two-tier network. MARK COOPER: Well they’re Johnny-come-latelys frankly. We were doing this five or six years before they arrived. But they discovered that if you give the power of gate keeping to the owners of the wires just like way back 100 years ago, the owners of the railroad had the power of gate keeping, it really does undermine our dynamic economy. BILL MOYERS: But let me step over to your opponent’s side for a moment. They say the very idea of network neutrality is really, a quote, "cynical ruse," a ploy by some well-heeled Internet companies to lock in their market share with the government’s help and ship all the cost of transmitting this heavy content entirely to the consumer. MARK COOPER: Well, in fact, consumers have been paying for the telephone network, the communications network. The key answer is that when I pay for the network when I buy service, the one fundamental principle has been is that I decide what I can have. The recent guys who come along and now and say they want to charge Google or eBay for using the network. They already pay a little bit to connect up to it. But I’m the guy who’s actually using the network. MARK COOPER: When I go out to Google’s site and I say, "Hey, click this," who’s using that network? I’m the one who has decided what to download. And I paid for the service. And if they want if they want to set up a category for really high-speed stuff and say, "Cooper, you have to pay a little bit more for this in order to get the high-speed stuff," that’s fine with me. And we actually have that already. They mislead you about that. That system already exists. Some people have dial-up. Some people have DSL. Some people can get a T1 line, they call it. But the key thing is that once I pay for that service, they don’t get the opportunity to say, "Google’s stuff goes. But eBay’s doesn’t." And that’s exactly what they want. BILL MOYERS: The telephone companies in particular, Mark, say that the fees they want will be used to build more capacity. Here’s what the head of AT&T told Congress: quote, "You cannot expect any company, my company or anyone else’s, to pour in these billions of dollars that are required to build infrastructure without some return." MARK COOPER: And they’ve been re-couping the cost by charging the customer. That’s the key thing. Is that I will pay a fair price for their network as long as I get to determine what services I can access. They want to change that. They want to charge me for part of the network. And they want to go out to Google or eBay and say, "Look, I’ll make a special deal with you. I’ll let your business go in this fast lane. But you know what? I’ll give you an exclusive deal on that fast lane." And they won’t let other people compete for the fast lane. So, they’ve become a gate keeper. Now they get to decide who’s going to succeed. ‘Cause let’s be clear: If one guy has access to the consumer at a high-speed rate and his competitor does not, eventually the competitors will disappear. And so what they’re doing is strangling competition at the level of applications like Google or content. And in exchange for building the pipes, that’s a bad deal. BILL MOYERS: Congress left town last month without settling the issue. What’s the next round in this fight? MARK COOPER: Well, you know that Congress left town without settling. But they didn’t pass a lot of money bills either. So, they went home to try and get reelected. And now they’re threatening to come back in a lame duck session, in which, one suspects, that a bunch of them might not even be coming back, right? So, it’s going to be a really lame, lame duck. But these lame duck sessions are really dangerous. Because what happens is, I have to pass a few money bills and what people will now say is, "Look, you got something in this money bill. Your money or your principles. Will you stand up for network neutrality?" And so we are concerned that, you know, in that kind of horse trading, principles tend to get compromised away. And the Chairman of the Committee in the Senate, Senator Stevens, has said he’s going to bring this up at lame duck. He’s looking for the votes he needs to break any filibuster. And so, the next few weeks is really important for those million people who were vigilant and stood up in the spring to keep an eye out because we don’t want a lame duck session to kill this most important principle of our society. BILL MOYERS: What makes you think people really care about this? Ordinary people? MARK COOPER: This is not just an arcane telephone kind of issue. You know? When you talk about universal service, people will get lost in it. People really do have a gut instinct about the openness of our information system. And they really are concerned about media concentration. They’re really concerned about the telephone companies and cable companies which control the flow of programming into their houses. There’s a rebellion about cable’s control of those 500 channels. And so, they really do care about it. And you don’t need a lot of technical expertise to understand. This is a choice between who gets to decide what information you have access to. Will there be a gate keeper? Will there be a toll booth? Or will there be a free flow of information? BILL MOYERS: But, doesn’t this come down to a wrestling match among some big guys? I mean, on the one side, the telephone and cable companies that want to charge Internet companies extra for higher speed access. On the other hand, giants like Yahoo and Google and Microsoft that want to outlaw those fees by mandating net neutrality. Isn’t it going to be decided by which side gives the most money to Congress? MARK COOPER: Well, you know, the interesting thing is those big guys you talk about were little guys a few years ago. And that’s the important point. Let me give you a historical example. When the Internet first was rolling out to the public, the big guys didn’t want to give away e-mail. They wanted to charge for e-mail as a separate service. The little guys at the time, the little Internet service providers, there were 8,000 of them at one point, we’re down to 2,000 now because they’ve been strangled by their network owners. So, the little guys said, "Hey. No, we’re going to bundle in e-mail." So, we don’t know who the little guys are. And we really have to worry about the little guys. Google, they may be a big company now. Who knows where the next big company’s coming from? And we know that in the Internet age, the big companies actually do have a real chance to start as little companies. But, if you let the telephone companies and the cable companies set up this scheme where they’re going to charge more to some people than others, you know who won’t be able to pay the freight? The little guys. And we’ll be killing the future of innovation. And so it’s not just the big guys versus the little guys. For us, it’s making sure that the little guys have a chance so it’s not big guys versus big guys. BILL MOYERS: When all is said and done, isn’t this going the way that television went and radio went and cable went with big commercial interests deciding what is in the public interest? MARK COOPER: Well, they have clearly lost control of speech on the Internet which is very, very different. If you look out at the Internet, one estimate is that 60% of the content on the Internet is produced by people not corporations. You look at commercial TV, zero. Radio, 5%, talk radio. Newspapers, an occasional op-ed maybe or a letter to the editor. Ninety-nine percent of the content in those three traditional media are from corporations. The Internet has turned that on its head. But it’s not necessarily commercial. That’s the important point. It’s not clear what the commercial activity will be other than Google selling eyeballs, right? But, it’s democracy. It’s conversation. There are the conversations between people worldwide on the Internet that did not exist ten years ago. BILL MOYERS: And how can you take that away? Isn’t there so much competition out there for news and information now that nobody can control it? MARK COOPER: Well, if your video clips don’t work or your video clips can’t reach lots of people, you will then be at a disadvantage. So they have put their thumb on that scale of democracy by discriminating against some people against other people. By giving their own services a better opportunity. And that will, in fact, undermine, slow down this democracy, this wonderful cacophony of voices we have. All those voices are today equal in their opportunity to reach, equal in their opportunity to ship stuff around. If you put these toll booths on, that equality of opportunity goes away. And it matters in the long run. BILL MOYERS: So, how does this issue of net neutrality fit into the big issue we’ve all been concerned about of media conglomeration? MARK COOPER: Well, I mean, let’s separate the two aspects of the Internet space. One is this non-commercial space, this public sphere which has this roaring conversation among people, thousands and thousands of bloggers. We need to keep that as open as we possibly can. On the commercial side, it’s not clear. I mean, if you think about the old world, the expression was, "in a world of limited shelf space, placement was everything", right? And you needed to get in prime-time. The placement is critical. In a world of infinite opportunity, it turns out placement is awfully important. It may be everything as well. Why? Because how are they going to find you? And so what we now have is we have the dominant companies who show their prime-time shows which get, you know, six, ten million viewers on Sunday night. On Monday morning, they’re available on their Web site. People know where to go for those clips, right? To watch those shows. And they’re selling advertising again on those Web sites. So, how the Internet will change the commercial space? It’s not clear. That is, it remains to be seen as people will come with business models that will break the hold. BILL MOYERS: We heard in our report Professor Timothy Wu refer to the Tony Soprano rules of capitalism. MARK COOPER: If you look at the issue, I think it’s more of the Robber Baron model of business. If you go back and look at what the railroads tried to do – the railroads said, "Hey, we want to be shippers too. We don’t want to just provide moving cars." And they began to discriminate. They would charge one shipper more than another shipper for the same product over the same distance. Why? Because they had an ownership interest in shipper A and they didn’t in shipper B. Towns were getting strangled by this discrimination. Rockefeller was putting all this competition in the oil business now because oil used to move by rail in the old days, not pipeline. And so, this was a model of the Robber Barons of the late 19th century. And our society, unlike many other capitalist societies said, "No, we’re not going to have it." We passed the anti-trust laws to break up the trust. And we passed the Interstate Commerce Act to say common carriage. These systems are so important to the flow of goods, and in the case of information, democracy that they have to operate on a non-discriminatory basis. Fundamental principle that in the information age, if you think how ironic it is, we now have the merging of communications and commerce of speech and commercial activity. And now, when the need for open, non-discriminatory networks is more important than ever, you do an about-face and abandon what was a fundamental and very, very productive principle for us. BILL MOYERS: Yale PhD, Fulbright Fellow, Stanford University consumer, the heart of American society. You’re no radical, right, on this? MARK COOPER: No, I’m a devout capitalist. But I firmly believe that there are some principles. And if you look back at our history, it was the re-affirmation of the commitment to an open society and an open, real competition. You know? We said we’re not going to let these cartels dominate our society. So sometimes, you need government to think of good ideas to impose principles and restraints on the capitalist sector. And our economy, and you had it in your piece, 80 percent of the telephone service and electricity service in America is provided by private companies subject to public obligation. That’s our model. It’s a darn good model. BILL MOYERS: Mark Cooper, Consumer Federation of America thank you very much. As you just heard, the heart of this debate is whether the concentration of media ownership serves democracy, diversity and the first amendment. More is at stake than just the Internet. Even as we speak, the Federal Communications Commission is thinking of changing the rules to allow a single corporation to own in one market, the major daily newspaper as well as up to eight radio stations and three television stations. And with the coming of digital broadcasting that enables one station to broadcast several signals, it’s conceivable that a dozen or more television channels in one city could be controlled by one company. Two weeks ago in Los Angeles the FCC held the first of several public hearings on these proposed changes. MALE COMMISSIONER: Thank you for being here. It’s an exercise in tightening our democracy. I look forward to the testimonies of the witnesses and the public comments we’re here to see. So thank you so much. COMMISSIONER COPPS: Now we’re back at square one, and it’s all up for grabs. And if we’re going to do a better job this time around, it’s going to be because of input from folks like you. BILL MOYERS: The big turnout included many folks from LA’s creative community who said media conglomeration is stifling local coverage of the news and the diversity of opinion and voices. Let’s listen to a medley of citizens who attended the hearings as captured by the PBS team at NOW. AUDIENCE MALE: How do you expect these corporations to give us a diversity of opinion if they can’t even give the marketplace a diversity of programs? JOHN CONNELLY: The air waves belong to the American people and we believe that it’s time for them to take it back. MIKE MILLS: We must ask the question: Is American radio better today than it was ten years ago? MIKE MILLS: That was the answer. Media consolidation has, without question, harmed localism in radio. SUMMER REEP: You have the keys to communication in your hands. You are responsible for whether we hear what is going on in this country right now. BILL MOYERS: One of the people at that hearing in Los Angeles is with me now. Eric Klinenberg is a scholar at New York University and the author of FIGHTING FOR AIR: THE BATTLES TO CONTROL AMERICA’S MEDIA, to be published in January. ERIC KLINENBERG: Thanks for having me. BILL MOYERS: Why the title Fighting for Air? ERIC KLINENBERG: Well, there is a kind of war going on around the United States today. It’s a battle of citizens who are fed up with what’s happened to their local media, their radio stations, their television, their newspapers. And they’re battling to assert control. Ten years ago the FCC and Congress relaxed the ownership rules, allowed a small number of companies to own more and more media outlets than ever before. And I think most people know what’s happened to their media by listening to the radio, or not. It used to be the case that no radio company could own more than two AM and FM stations in any one market. Today they own up to eight, and they’re trying to get ten or 12. What’s happened is that they turn those radio stations from valuable local community assets, places where you could go to get local news, reporting about your institutions, your local music, into places that played preprogrammed content. And the result is that people turned the stations off. BILL MOYERS: Everywhere I travel people say we’ve lost our local radio station. There’s no local news here. There’s not even any local personalities on anymore. But when the Internet appeared almost out of nowhere a dozen years ago, people said, "Oh, well, the Internet will solve the problem of the paucity or lack of information from radio and local television." Has the Internet done that? ERIC KLINENBERG: The Internet is an incredible medium. And it’s about to become even more powerful, more incredible, because radio, television, newspaper, movies, all of these things will be available to Americans through the Internet. Unfortunately, what the Internet has not added is local content. The Internet gives us a world of information about the world. You can get British and French newspapers like never before. But your viewers should ask themselves: How much local radio is actually available? How much local broadcast content? How much local reporting that’s not already available in other outlets comes through the Internet? And the answer is incredibly little. It’s just not the solution for the problem of local media. RICK KARR: , my colleagues who produced the piece on the Internet. It comes to us from the Gulf Coast of Mississippi. Let’s look at it. RICK KARR: Local media can mean the difference between life and death. Take the example of Hancock County, Mississippi, on the Gulf Coast. Its two local commercial radio stations went off the air after consolidation changed the rules of the radio business. A local volunteer launched a community FM station, the only broadcaster in the county. And then hurricane Katrina hit. RADIO ANNOUNCER: This is WQRZ LP 103.5 FM. Stay tuned for a public bulletin from the Hancock County Emergency Management Agency. Hancock County has suffered extreme devastation. The First Refugee Shelter is available at Bay High School. School distribution sites for food distribution and ice opened from 8pm. FEMA has established a family assistance center. SARA ALLEN: Radio works because in an emergency such as Katrina, people didn’t have power. They didn’t have portable televisions. Television could not do the job. Radio, almost everyone has a car radio that works. BRICE PHILLIPS: Our number one goal was to make sure that it doesn’t matter what programming you run. We’re just waiting for the emergency. BRICE PHILLIPS: That’s what that this station is designed to do, was to be 24/7, and we were going to build it to where it was survivable by any natural disaster. Especially hurricanes. RICK KARR: The water got to the point where it was up above our heads where we’re standing right now, right? BRICE PHILLIPS: I didn’t know that all of the rest of those stations were out. I had no clue. I think I’m one of 1,000. But I’m just serving my own community. I had no clue that I was one of four out of 41 that survived. RICK KARR: Brian Adam, whom just about everyone calls by his nickname "Hooty" – directs Hancock County’s emergency operations center. BRIAN ADAM: Well, just him putting out our evacuation orders and staying on the air 24 hours with no sleep, him constantly saying, "Folks, this is going to be bad. The Weather Service says it’s going to be bad. The National Hurricane Center says it’s going to be bad. Ya’ll got to please leave." BOB McCHESNEY: If you look at radio, it’s extraordinary inexpensive compared other media, compared to television. It’s ideally suited for local ownership. Doesn’t take a lot of capital. It’s almost cheaper than doing a Web site, in fact. I mean if you get right down to it, the costs are that low. And it’s accessible to anyone that’s got a radio, which basically means it’s ubiquitous. BOB McCHESNEY: As the ownership has become increasingly concentrated what we’re seeing is that local coverage basically is being stripped out everywhere. Local journalism, local news rooms, community media basically doesn’t make a lot of profits for these firms. Syndicated stuff does. So in community after community we’re seeing there’s hardly any coverage of public life. RICK KARR: That wave of mergers alarmed the FCC. In an effort to bring local radio back to communities that’d lost it, the commission started licensing hundreds of new, local low-power FM radio stations. WQRZ is one of a few hundred nationwide, mostly in small towns and rural areas. BOB McCHESNEY: Low power FM is an extraordinary story in a number of ways. It said basically for a few hundred dollars you can put out a pretty good signal that’ll cover a city, or half of a major city, and all of a small town at low power. Well, it was despised, obviously, by the commercial broadcasters. The last thing they needed was a lot of new options on the dial that were local people doing stuff locally without ads on the air. Brice Phillips was one of the few to win one of the new licenses. He says WQRZ proves that it doesn’t take much money to get a radio station on the air: he lives on social security checks he receives for a medical disability, yet before the storm, he built a transmitter shack and hundred-foot tower himself and turned a bedroom of his house into a broadcast studio. The shack and tower weathered the storm; the house didn’t. RICK KARR: Sara Allen is a radio engineering consultant who came to Hancock County as a volunteer about a week after the storm, to help upgrade WQRZ’s signal so that it could reach more of the devastated county. BRICE PHILLIPS: Ain’t nothing better in the world to see that tower up there. It was just, I was elated. I couldn’t even…there was no words. I was just like on cloud nine. I saw my tower and it was like, "Yeah." I couldn’t believe it was still there. RICK KARR: Allen was so impressed with Brice Phillips dedication and the station’s vital role in the wake of the storm that she decided to stick around. She spent hours on the air reading announcements and spreading news. SARA ALLEN: As broadcasters, he and I realized that that’s our mission. We have to stay on the air. RICK KARR: The F.C.C. allowed WQRZ to crank up its power from 100 watts to nearly 2000, enough to expand the station’s reach to 30 miles. Nine months after the storm, WQRZ was still Hancock County’s only broadcaster, and Brice Phillips was still airing hours of interviews and information every day from a new studio at the county emergency operations center. BRIAN ADAM: To me, the logic behind getting him high powered status was so the whole county, and even some in Harrison County, could hear him. And, you know, we’re still trying to keep his high-powered status at this time. BRIAN ADAM: He’s probably saved as many people after the storm than he did before the storm because of being able to tell them where to go get food, water, and ice. BRICE PHILLIPS: FEMA bought 3500 AM/FM radios like that one I have right up there. And they gave them out where they gave out food, water and ice. And that’s how they knew where we were. Because they gave one to every survivor. RICK KARR: So FEMA was actually telling people, "Here’s some food. Here’s some water. Here’s some ice. Here’s a radio." BRICE PHILLIPS: Here’s a radio. RICK KARR: There are commercial stations in Biloxi and Gulfport which aren’t too far from here. Weren’t they doing the job that was necessary here in Hancock County to keep people apprised of what was going on? BRICE PHILLIPS: Not more than a couple hours, the whole house. And then, from the floor level down it stayed in water for two weeks, at least, you know, from the floor down. BRICE PHILLIPS: I cannot replace my house. I don’t have the money to do it. I’m on social security. I get 500 bucks a month. But there’s no way that I can rebuild my house much less the studio. You know? So actually in a way, that’s why I’m in this level of service to my community. Because when you’re left with a last resource, you share it with your friends, you share it with your family and you share it with each other. RICK KARR: What makes you want to give and share when you’ve lost everything? BRICE PHILLIPS: It’s what you do. I didn’t get into public radio not to share. Otherwise, I’d be in commercial radio. BILL MOYERS: What do you take away from that story? ERIC KLINENBERG: Well, that’s an ethic that will be foreign to a lot of commercial broadcasters today but will be quite familiar, I think, to a lot of viewers and people who follow radio. That’s a story of a low power FM radio station run by a small number of people and a small, not particularly affluent community, because they care about the place where they live. They want news about the place where they live. They want culture about the place where they live. And at the most fundamental level, they want emergency information when there’s a crisis. And I think that sadly, the track record of the big commercial broadcasters today is that they failed on all of those scores. BILL MOYERS: As you travel the country, what has happened to local reporting, to alternative journalism out there? ERIC KLINENBERG: Well, I’ve seen a decline in the number of people out there doing local reporting. I’m a little afraid of a myth going around that we don’t have to worry about the loss in professional journalism because there are citizen journalists who will make UP the difference. I think there’s some terrific bloggers out there, terrific people who sit at their computer and have smart things to say, good editorial writing, lots of good commentary. But actual local reporting, the kind of hard coverage that’s regular, sustained, probing, penetrating? That requires resources. It requires skills. It can require institutional backing. That’s not the kind of thing that citizens do as well as professionals. And I think this is a time for Americans to be defending professional journalism for what it can deliver. Let’s remember that American democracy is intensely local. That’s one thing that makes this country just different from many other places. Our city governments, our state governments have tremendous power to shape the institutions that affect our lives, the lives of our family members, our children. In the absence of regular professional reporting, looking at what’s happening at the school board, the tax board, the roads, the hospital, local businesses, we have potential for incredible abuse. BILL MOYERS: You write in your book about the extraordinary levels of local interest in this issue of media reform, like that story in Lafayette, Louisiana. Have you found active bipartisan coalitions in other communities around the country? ERIC KLINENBERG: Well, I have. And this is another remarkable thing. We live in a time when Americans are despondent about the so-called cultural wars, the division separating the red states and the blue states, the conservatives and the liberals. But look at the issue of network neutrality or Internet freedom. Look at this issue of consolidation and competitiveness in American media markets. You find that Republicans and Democrats alike are coming to the table and fighting for air together. BILL MOYERS: Is Congress listening? Is the FCC listening? ERIC KLINENBERG: I think what Congress and the FCC understand all too well at this point is that the more open and public and democratic a hearing this issue gets, the less support there is for media consolidation. And so the danger is that Congress and the FCC will rush legislation through before anyone has a chance to really participate. I look for the FCC to be rushing to get legislation passed without a democratic process. I’m very concerned about that. It happened in 2003. There’s every sign that it’s about to happen again. And again, one reason for writing this book is to issue an invitation for all Americans to get in touch with their local congressional officials, to get in touch with the FCC, and to demand the kind of open, free media that once made this democracy in America very strong. BILL MOYERS: That hearing you attended in Los Angeles, as I understand it, word went out about it only three days in advance. ERIC KLINENBERG: This is incredible. Think about another issue where you could have three days advance notice and find 500 people in an overflowing room at one PM on a workday to come together and sound off on a major public policy issue. In 2003, the FCC said it would do these kinds of hearings. They started. They then aborted the hearings once it became clear that the message, no more consolidation, was not what the then chairman Michael Powell wanted to hear. And then the commission ignored the public input altogether when it came time to crafting legislation. They got reprimanded by the courts. The order got remanded. It’s now back in play. And the question now is whether these kinds of hearings are democracy for show or whether they’re democracy for real. BILL MOYERS: Whose side is the FCC on? ERIC KLINENBERG: Well, sadly, it looks like the FCC has been working in the interests of the small number of companies it’s charged with regulating. We need the FCC to be accountable to the people, accountable to democracy, and responsible for making sure our democratic culture works. This is an issue that transcends party lines. And I have to say, for anyone who’s despondent right now about the state of America’s political culture, pay attention to what Americans from all walks of life are doing on media. It’s incredible to see these bipartisan coalitions. They’re in every city in town. Americans coming together to fight for a better media. BILL MOYERS: The book is Fighting For Air: The Battle to Control America’s Media, by Eric Klinenberg and it’s out in January. Thank you for joining us. In the meantime, you can go to PBS.ORG to find out more about media and democracy. I’m Bill Moyers. Thank you for joining us.